The Seafront Apartments are a group of self catering holiday homes that are located a stone's throw from the beach in Cullercoats near Tynemouth in Tyne & Wear. Our holiday homes are perfect places to stay if you are a couple on a weekend break or a family away for a long holiday. 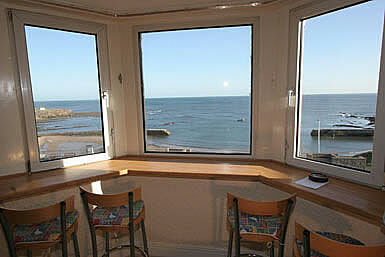 The holiday apartments can be let individually or as a group and can accommodate up to 16 people. 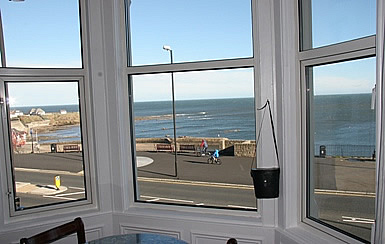 All of the self catering apartments are decorated and furnished to a high standard and most have lovely views of the coast. They are well equipped and include a Freeview TV, a DVD player and CD player. The kitchens are fully fitted and have all the utensils you may need during your stay. The beds will be made up ready for your arrival as linen and towels are provided. The building is child friendly and we supply buckets, spades, nets and games. Outside is a large yard with a hose and is an ideal place to store surf board, wet suits, mobility scooters and bikes. Our self catering apartments are only a short walk from the centre of town where there are a selection of shops and restaurants. We are surrounded by wonderful walks which provide guests with the opportunity to take in the fresh sea air. Newcastle city centre is 20 minutes away by the efficient and very frequent metro trains. For those coming by car, we supply a permit for parking on Beverley Terrace.